Barnet's supplier payments for September are out. First of all the good news. The spend with Comensura seems to be slowing slightly with spend in September down to £1.28 million and a year end forecast down to £18.47 million, still more than last year but starting to fall. I did raise a very real concern that the figures being provided to the Financial Performance and Contracts Committee do not reconcile with the figures published in the suppliers payments. As yet no one from the Council has come back to me as why there is such a large difference. This is the last month of Comensura figures as the contract has now been awarded to a company called Matrix SCM but I will continue to monitor their spend. 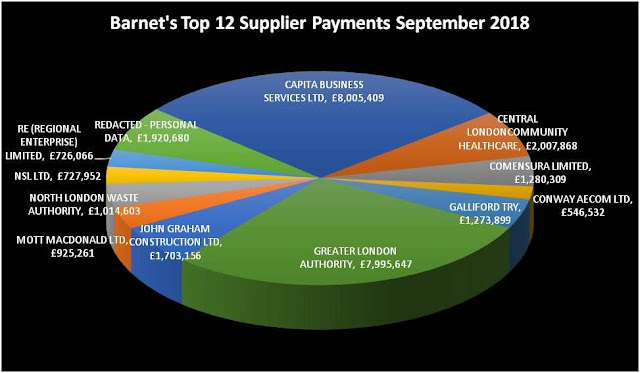 This month Capita received a bumper payment of just over £8 million on the CSG contract and a more modest £726,066 on the Re contract. We will have to wait and see what the contract review brings and whether Councillors will actually agree to bring services back in-house and finally get these costs under control. I will of course continue to keep a close eye on Barnet' spending. Capita is having difficulty with its own finances. Over the last year I have been reviewing the properties acquired by Barnet Group. The idea of the acquisitions is sound, to buy properties for people who would otherwise be placed in rented temporary accommodation. 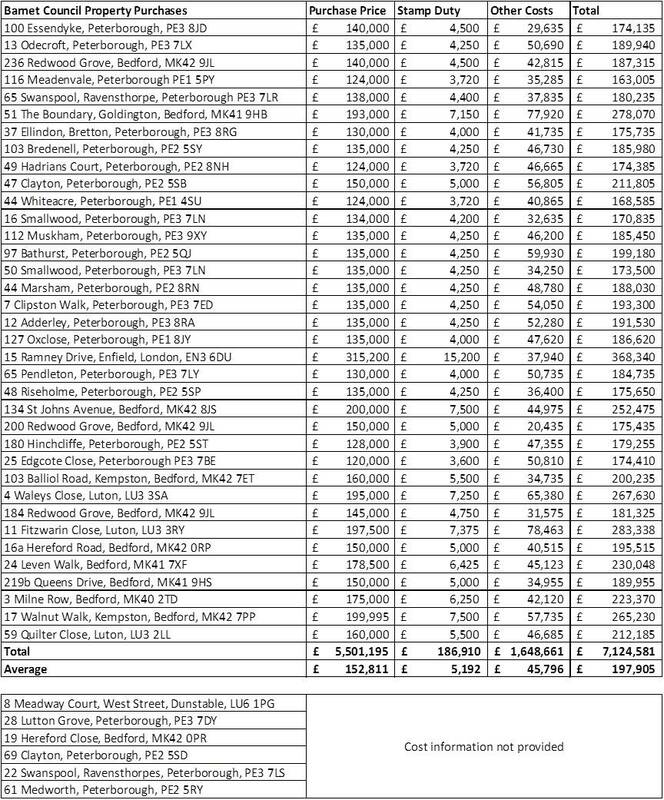 Last year Barnet decided that it would be cheaper to buy those properties in Peterborough, something I blogged about here last year. However they failed to agree this strategy with Peterborough Council who felt that this was putting a strain on their own housing market. Management to the refurbishment process. In 2017 Barnet Homes acquired a number of properties. 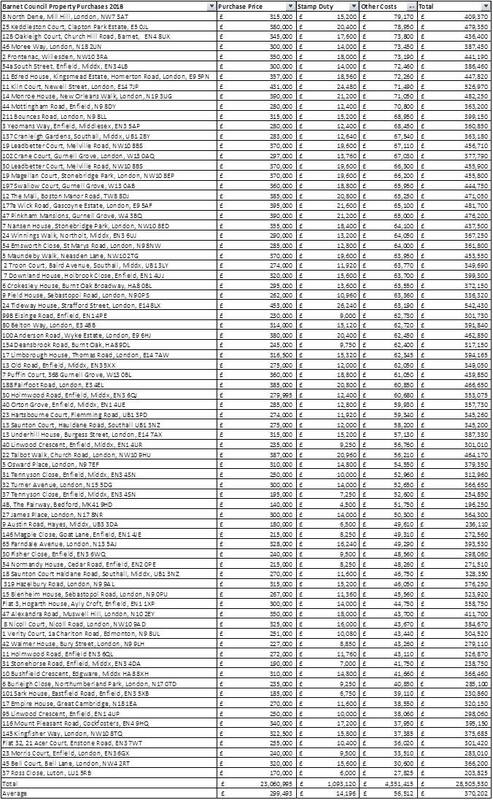 I have taken the details and figures from a number of Council Delegated Powers Reports (DPR) for the 42 properties I know about. All I have done is collate that data into a table. Set out below is a table showing the purchases in 2017. "Many of the properties require extensive refurbishment to get them up to the Barnet Homes standard. 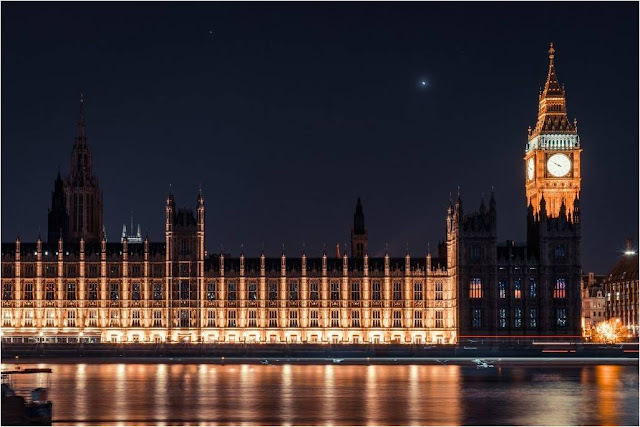 This can include works to the structure of the property such as new doors and windows, plus works to roofs and guttering as well as asbestos surveys and consequent removal, new heating systems, kitchens, bathrooms, and redecoration". My argument is that if properties need that much work then that should be reflected in the purchase price or maybe you should buy different properties especially if these works take a long time to carry out. Also if you are buying this many properties you would have a team to manage this process and have agreed suppliers of kitchens and bathrooms at a discounted price. Jump forward to 2018 and 77 more properties are being purchased closer to, or in, Barnet. Set out below are details of the properties acquired. As you can see from the table above the additional costs are now averaging £56,512. This was explained to me that it automatically includes a lease extension allowance of £15,000 where it is a flat and that some of the properties have an extra bedroom and that adds to the refurbishment costs. 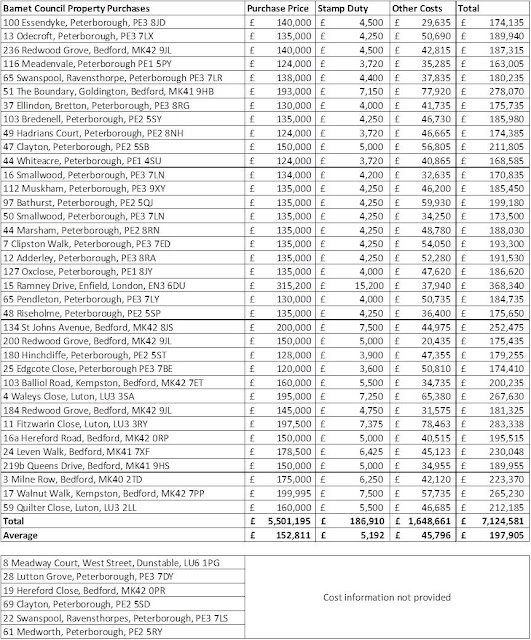 What is troubling is how so many properties can have such a huge additional cost of over £60,000. I did ask about the property that had nearly £80,000 of additional costs on a property costing £315,000 but I was told that this sale has now been discontinued. There is a degree of irony as many of the 2018 properties are ex local authority properties. Indeed, at least one property is a former Barnet council house previously sold under right to buy. I googled Zoopla and found interiors of the property from 2013 when it was offered for rent. You can see them here. 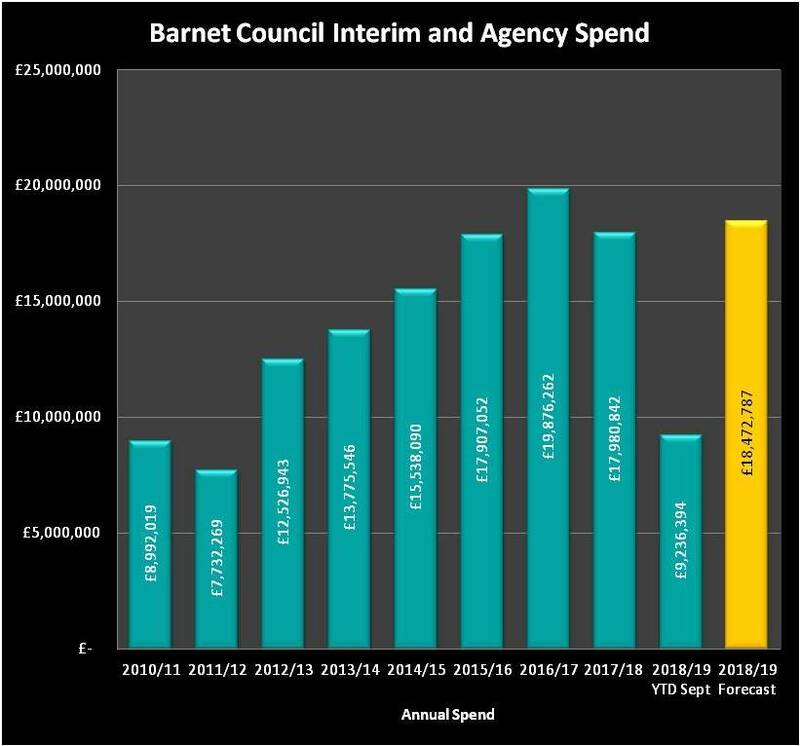 OK, it is 5 years on but it is hard to see how it is necessary to spend £37,950 especially as Barnet Council own the freehold. At the Financial Management and Contracts committee this week I mentioned these costs and asked who was checking. Cllr John Marshall challenged me and asked if I understood why these properties were purchased. Yes of course I do and I welcome the principle of what is being done especially as the latest crop of properties are much closer or in our own community. My problem is who is checking all these extra costs which on the face of it seem excessive and much greater than councillors were led to believe when they signed up to this strategy. So far the extra costs are just over £6 million compared to the best case estimate of £2.8 million and a worst case scenario of £3.8 million. That shortfall (compared to the worst case scenario) of £2.2 million could pay for 90+ full time care support staff, or is the equivalent of all the savings from the decimated library service cuts. Barnet are focused on cutting budgets but I worry that they don't pay enough attention to controlling costs.